Cid Style File: Updates and Such! Remember last week when I announced my feature in the City Chic Blogger Lookbook? Well City Chic is asking who is your favorite blogger and who you want to see featured in the next Blogger Lookbook. I am hoping its ME! 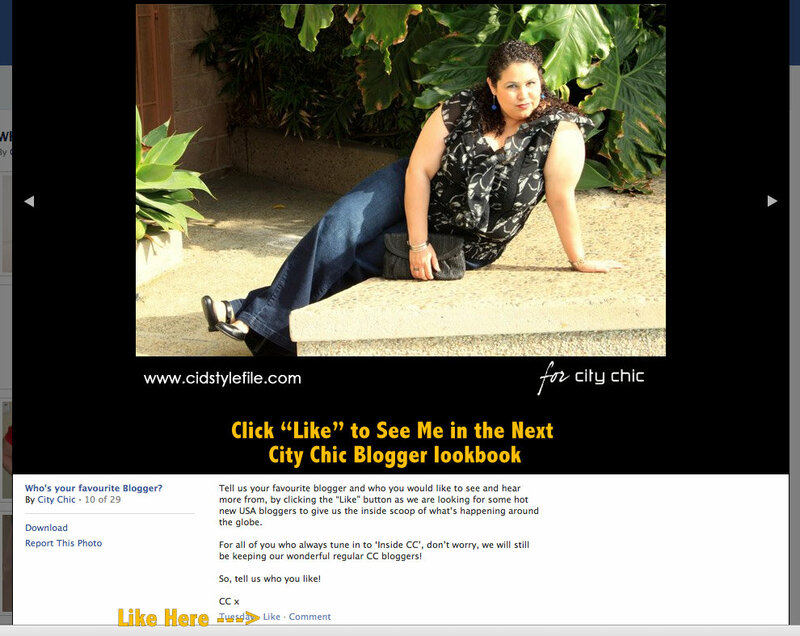 City Chic is asking people to vote by "liking" the pictures of the bloggers. I would be more than honored if you liked my picture and help me be in the next lookbook. Just click the link to City Chic Facebook here, find my picture (I'm the only one not standing) and click like! You have to be a facebook member to like picture and may have to like City Chic page as well. Thank you for your support and 'liking" my picture! In about 2 weeks I will be attending a blogger conference called BlogHer 11, have you heard of it? Its not a fashion related conference but rather a blogger conference focused on women bloggers. I have known about BlogHer conference for few years now, but will be my first time attending. I am excited to attend and reunite with some blogger friends and meet new one as well. Are any of you attending? If you are attending, please let me know would love to meet you. I will be tweeting and updating Faceboook through out the conference on the weekend of August 5-6, so please follow either or both to see my updates. I hope to bring you lots of conference fashions and many other blogging related news. I am still seeking sponsors for BlogHer11 if you are a brand or company wanting to have representation please see my "Sponsor Opportunities" tab for details. The list can be embedded onto your sidebar to showcase :) Enjoy!